According to the Nikkei this week India will agree to adopt Japanese Shinkansen technology and Japanese funding for a 505 km High Speed Rail line linking Mumbai with Ahmedabad. Trains would travel at speeds of up to 320 km/h, thus shortening travel time between the two cities from eight hours to two. Construction is expected to begin in 2017, with completion currently planned for 2023. Prime Ministers Narendra Modi and Shinzo Abe will apparently issue a joint statement on Saturday during Abe’s visit to India. 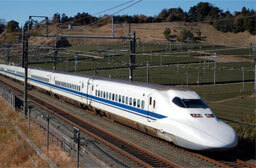 Once India makes its decision to adopt Japanese train technology official a tender will be issued. The Japan International Cooperation Agency (JICA) and India’s Rail Ministry began a joint feasibility study on High Speed Rail two years ago. A report recommending the Shinkansen solution was issued last July.